All of the close up shots in the following photos were digiscope shots taken at approximately 160X. The general view photograph was taken just with the digital camera with its lens set at 10X. These were birds discovered during the annual North American Migration Count and other members of the party were Linda Lou Baker and Linda Huber. A stop at Mammoth Wetlands during the North American Migration Count yielded this nice Short-billed Dowitcher. 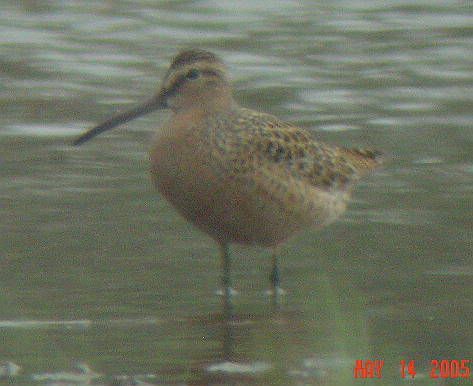 It was identified as a Short-billed Dowitcher without hearing a call from it. However, the markings on the flanks of the bird were more spot-like than barred as one would expect with a Long-billed Dowitcher. Also, the belly was whitish instead of ruffous. The former is characteristic of Atlantic Short-billed Dowitchers and the latter is characteristic of Long-billed Dowitchers. It would have been a good shore bird day for the migration count if this was the only one we saw. However, things were to get even better. Next we went over to the lake at Mammoth Park and stopped at the parking lot at the reconstructed coke furnaces. We looked across the lake at some small, exposed mud islands and saw a group of shorebirds. 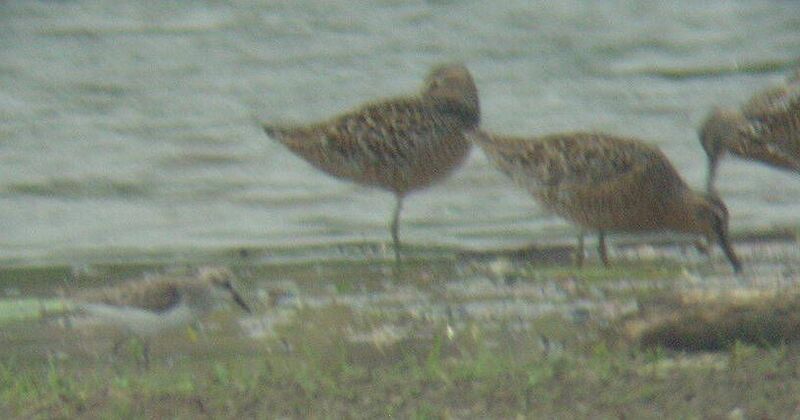 When we got the scopes on them, it turned out to be more Short-billed Dowitchers. This is a shot of a few of them. There were so many, I couldn't get all of them in one scope view! 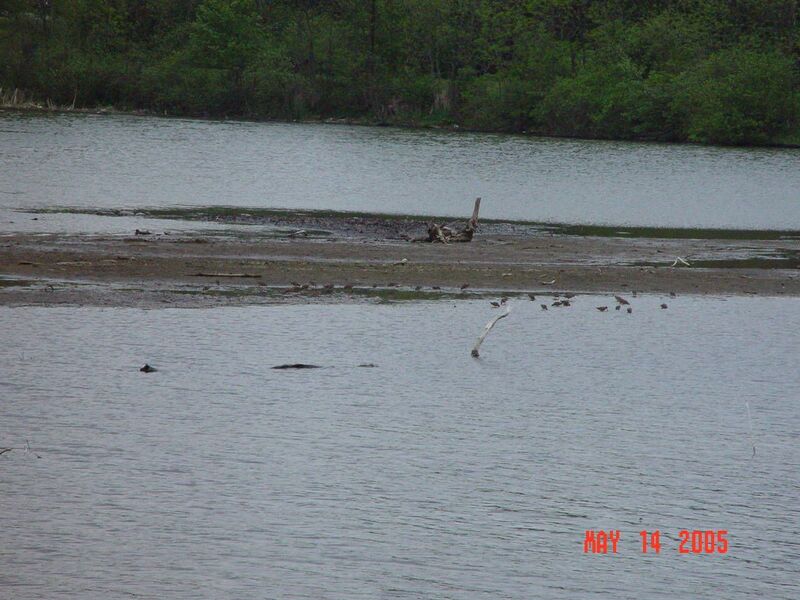 This is a photo of more of the flock of Short-billed Dowitchers seen at Mammoth Park Lake. We did not see any that appeared to be Long-billed Dowitchers and none of them called while we were there. 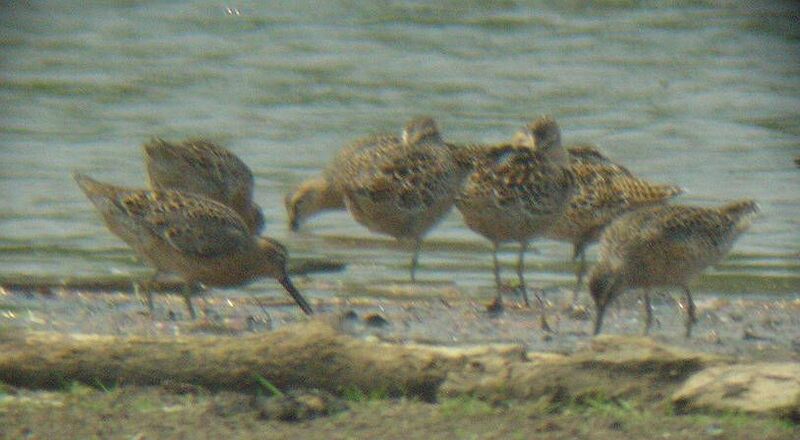 This is a general view of the Short-billed Dowitcher flock from the opposite shore from the digiscope photographs. All of the birds that show up as spots along the mud island are Short-billed Dowitchers (some are in the darker area on the left). We counted a total of 32 Short-billed Dowitchers. It is the largest single flock of Short-billed Dowitchers I've seen in the state and all were in breeding plumage! There also were some other shore birds at Mammoth Lake along with the Short-billed Dowitchers. This photograph is of one of three Semipalmated Sandpipers and some of the Short-billed Dowitchers that were present. 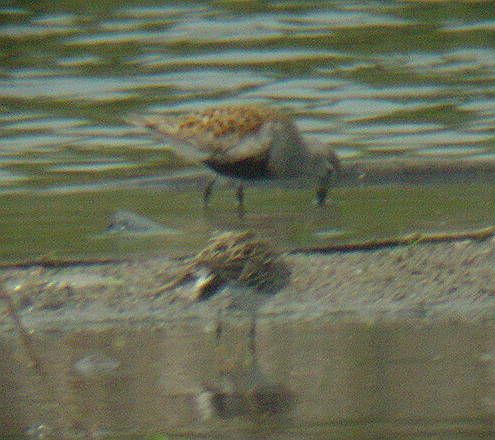 This shot shows a Dunlin, with its charcteristic black belly in breeding plumage, and a Least Sandpiper (lower bird) that also were at Mammoth Park. 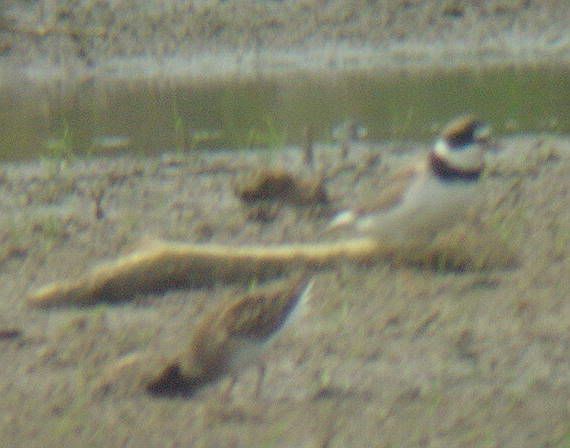 There is a Least Sandpiper in the foreground and a Semipalmated Plover, one of six seen, in the upper right of this photograph. They also were at Mammoth Park. 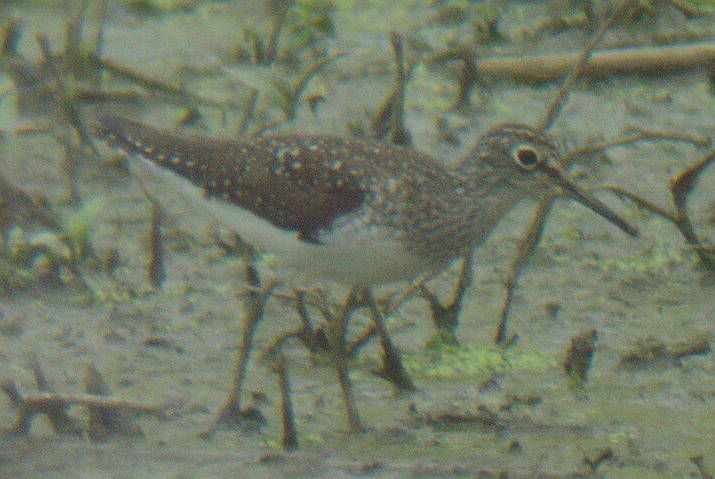 This is one of two Solitary Sandpipers that were seen at Mutual Wetlands during the North American Migration Count. It has a distinctive eyering characteristic of the species.